As the celebrated part of the Belle Haven Challenge Cup, a regatta hosted by The Belle Haven Club in Greenwich, CT on June 24 that benefits Sail To Prevail as the National Disabled Sailing Program, 12 disabled veterans and several members of the New York Mayor’s Office for Disabled People took up positions as active crewmembers on the classic 12-Metre American Eagle, sponsored by Bank of America Merrill Lynch. This is the second consecutive year that Bank of America Merrill Lynch has committed $25,000 to this event and to Sail To Prevail, as part of the company’s longstanding support of the nation’s military. Founded 32 years ago, Sail To Prevail has created opportunities for over 15,000 disabled children and adults to use sailing as an experience to overcome adversity in their lives. 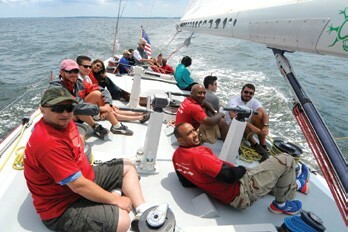 The organization has a growing commitment to serving veterans, and works closely with the Paralyzed Veterans of America in hosting therapeutic sailing programs, as well as advanced racing clinics and regattas. 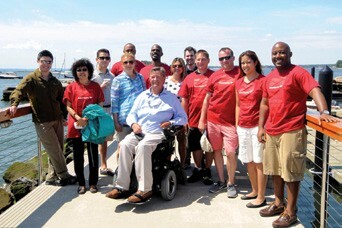 Joining these disabled veterans were Bank of America Merrill Lynch employees, including members of the Bank’s Disability Advocacy Network and Military Support & Assistance groups, and representatives of the New York Mayor’s Office for Disabled People, a first-time partner in this event. Four teams competed off Greenwich Harbor in heated races in famous America’s Cup yachts American Eagle, Weatherly, Nefertiti and Intrepid. Sail To Prevail is a non-profit organization and accepts charitable contributions to support its work with disabled children, adults and veterans. To learn more about Sail To Prevail’s therapeutic sailing programs and events like the Belle Haven Challenge Cup, visit sailtoprevail.org or contact Paul Callahan at 401-849-8898. David F. Guertin is Sail To Prevail’s Vice President of Development.